This feature is a practical tool when you want to upload multiple files under one record in Lexbe eDiscovery Platform (self-loading Summation & Concordance loadfiles). You can upload a production to Lexbe eDiscovery Platform from the Case>Add Case Documents page using a compressed ZIP file format and the file name ending with the extension '.lexbeupload.zip' (e.g. LexbeProd001.lexbeupload.zip) including a file mapping excel. We recommend that WinRAR be used for creating the zip files as part of the Lexbe load file process. Versions are available for Windows and the PC. Other versions of Zip creation programs may work, but we have not tested them and do not support them. In particular, Zip files using the native MAC zip file creation functionality may fail and we do not recommend it. If you can't upload productions or metadata using Excel spreadsheets and you believe you should have administrative rights to the account, please contact the Account Admin User(s) of your account. In addition to you loading data yourself, if you'd like us to upload files for you we offer several options. We offer TIFF Load+ and PDF Load+, for loading of TIFF images or PDFs, optionally with standard load files, for $60/GB. This charge is waived with a six month hosting commitment. You can send us files for loading by sending to us on a flash or USB portable drive, or by Secure FTP. Please let your sales representative, know if you'd like for us to load for you. We recommend this feature for Power Upload users with advanced Excel users, familiar with using complex formulas and data management features for 'Quality Assurance & Control' during self-loading files. This will prevent specific other users from changing your security settings without asking permission, protecting the confidentiality of your client’s documents. If you've never uploaded loadfiles before, you should plan sufficient time to meet any production or document deadlines, including ours and your quality control procedures. When you upload a TIFF production without creating the proper load file, it will result in not joining pages in documents, which means that the upload will not combine the files properly into the same record or generate duplicates! The supported self-load is only for a standard conforming load file, per our specs, and non-conforming load files would incur hourly charges. Non-conforming load files would incur hourly charges, due to the fact that TIFF load files can be non-standard or corrupt, including corrupt or missing TIFF files, corrupt or missing text files, missing or corrupt data, field inconsistencies, file count mis-matches, misaligned or missing metadata, or other non-defined matters. When we receive a non-standard load file, we may be able to partially load or not, depending on the degree of problems. Please upload our samples of Production and Loadfile to a test case, before creating and uploading your own! >IMAGES: Including all the TIFF and other image files (image files are page based). When uploading TIFF productions, our system will combine all the TIFF pages of a document into one record. 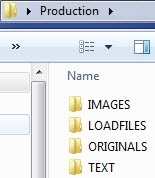 >LOADFILES: Under this folder you will include the file mapping Excel spreadsheet. The Loadfile must be saved as an Excel spreadsheet and the file name ending with the extension '.lexbeuploadmapping.xlsx' (e.g. Lexbe.lexbeuploadmapping.xlsx). The Excel file will only need columns of data, no headers. Column A should have the title of the documents, whether it is an ImageId, Bates title or any other unique name. NOTE. When you upload a TIFF production without creating the proper load file, it will result in not joining pages in documents, which means that the upload will not combine the files properly into the same record or generate duplicates. >TEXT: Folder designated to all the Text files that are document based. Please note that if the files are TIFF images, each one of them needs to be listed on the Excel sheet saved under the Loadfiles folder. Column 'A' should have the title of the documents (e.g. IMG0000001) and column 'B' the letter 'Y' to designate when one document ends and another begins. The picture below is an example of an Excel spreadsheet ready to be uploaded. The letter 'Y' from column B in Excel will indicate to the loadfile when one document ends and another begins. If the files are not page based documents (not TIFF or image files), then every document will need a page start indicator in column 'Y'. NOTES: The Bates names in the Lexbe loadfile Excel spreadsheet, and the file names in the ORIGINAL, IMAGES and TEXT folders, must match exactly or the load will fail! >Lexbe eDiscovery Platform supports the two most recent versions of Excel for Excel integration (2010 and 2013) and we recommend an upgrade from previous versions of Excel before you start creating loadfiles. >Don't add any letters or characters to the file name extensions '.lexbeupload.zip' (.lexbeupload02.zip) or to the Excel spreadsheet name ending with the file name extension '.lexbeuploadmapping.xlsx' (e.g. Lexbe.lexbeuploadmapping02.xlsx). Those type of file name extensions if not saved exactly according to our instructions, might not combine the files properly into the same record or generate duplicates. The production must be compressed in a ZIP file format and the file name ending with the extension '.lexbeupload.zip' (e.g. LexbeProd001.lexbeupload.zip) including a file mapping excel. * Here is a sample of a Production ready to be uploaded. We recommend that you use it as sample file to get familiar with the Production Upload process in Lexbe eDiscovery Platform. For self loading native format production in Lexbe eDiscovery Platform, please click here! You should expect an approximately 10 GB/day processing rate within your Lexbe eDiscovery Platform account (combined all cases) for native files (including PDFs), or OCR of image PDFs, if you are uploading the files yourself. Similarly, you should expect an approximately one GB/day rate within your Lexbe eDiscovery Platform account (combined all cases) to create Productions (including Bates numbering and TIFF creation if selected) or Briefcase downloads. Your time to download is in addition to this, and will depend on your internet download speed. You should plan sufficient time to meet any production deadlines, including your quality control procedures, the possible need to rerun productions if changes are made, and possible delays in downloads/slower downloads than expected/need to restart downloads. We do not have a feedback indicator as this is a new feature, but you can request an email notification of download completion when you run the production. You can safely delete the original production file (e.g. 'LexbeProductionOriginal.lexbeupload.zip') from the case after the files have been extracted.